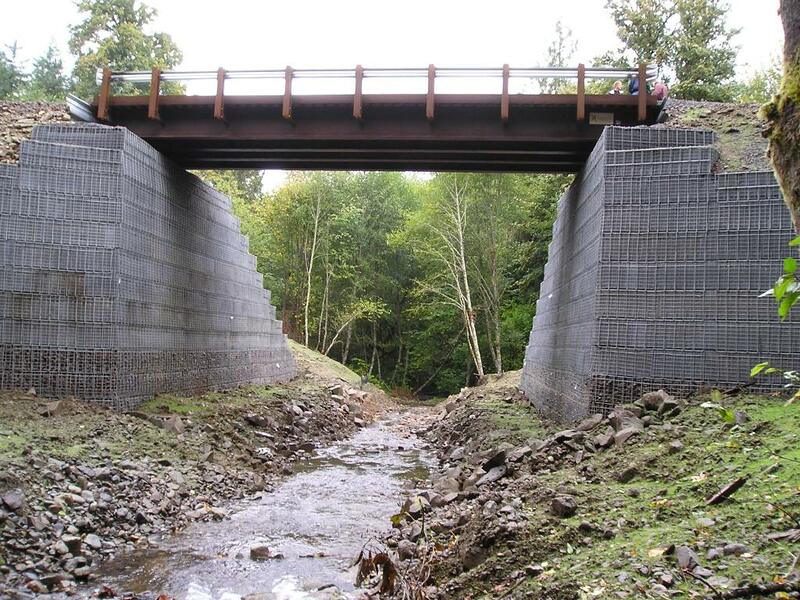 Structure: Replacement of a 48” fish-barrier culvert with a 120-foot Rapid-Span bridge on tower & pad abutments. This project required re-aligning the existing road to improve a tight corner and included conduit attached to the bridge to facilitate various utility lines. Structure: Installation of a 130-foot Rapid-Span bridge on steel pile. 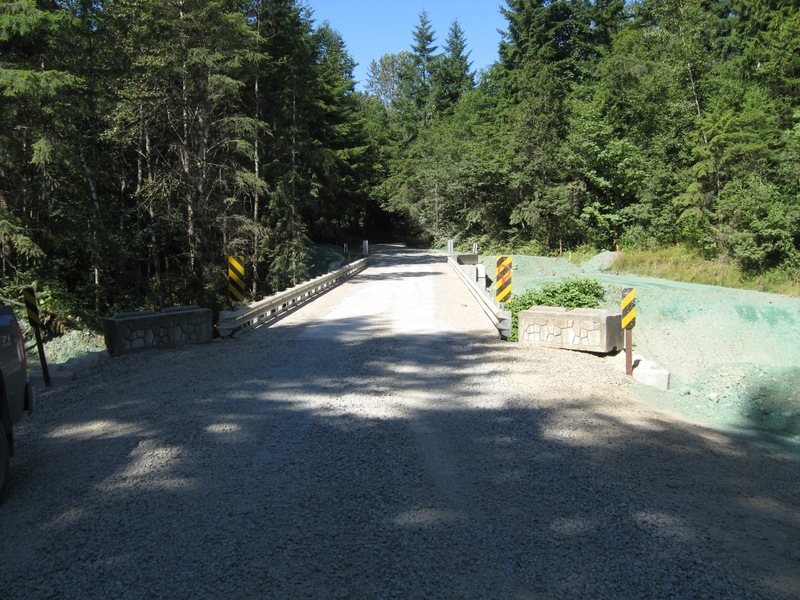 The significant height requirement of the bridge combined with near proximity (<3') of the structure to the property line required the design of a geogrid reinforced fill with block facing for the bridge approaches. 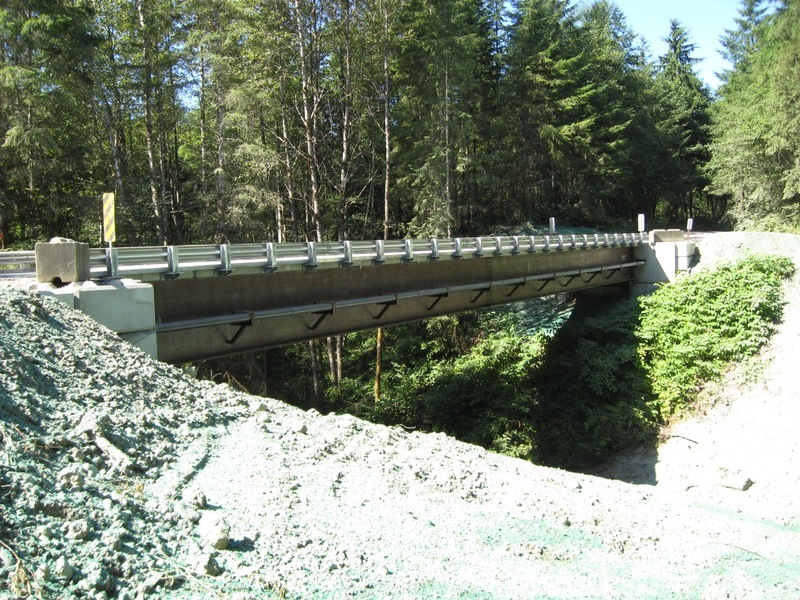 Structure: Installation of a 55-foot Roscoe Steel bridge on 12-foot high Hilfiker MSE (welded-wire-wall) abutment system. Ecology-block with geogrid fills were designed to facilitate road approaches. 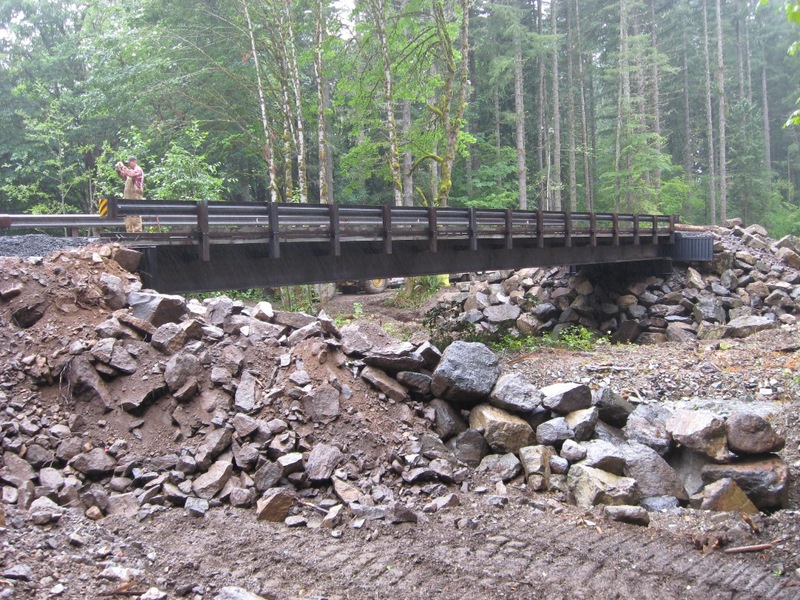 Structure: Stabilization and restoration of mainline haul road using Hilfiker Spiralnails© and Wire-Truss-Wall system; Spiralnail design in cooperation with Aziz Engineering, Redmond, Washington. Structure: Placement of 90-foot RTI Bridge structure on precast concrete pad with steel tower abutments. 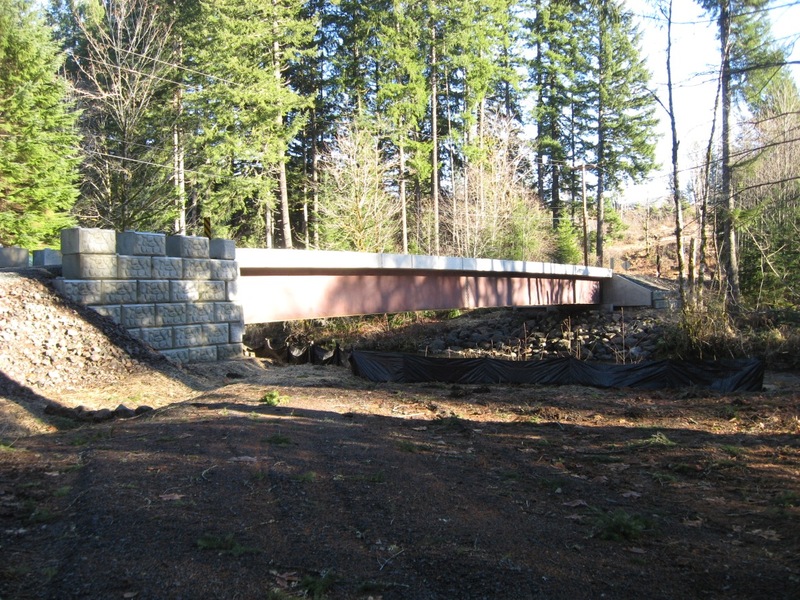 Due to stream conditions, the bridge needed to be significantly elevated, PFR specified this hybrid abutment system. Structure: Replacement of an 84” concrete pipe with a 50-foot Big-R bridge on 35-foot high Hilfiker Spiralnail© Trinity Wall System abutment; Spiralnail wall system was designed in cooperation with Aziz Engineering, Redmond, Washington. This was the first (and currently only) application in the world using a Hilfiker Spiralnail© Trinity Wall system as a bridge abutment. 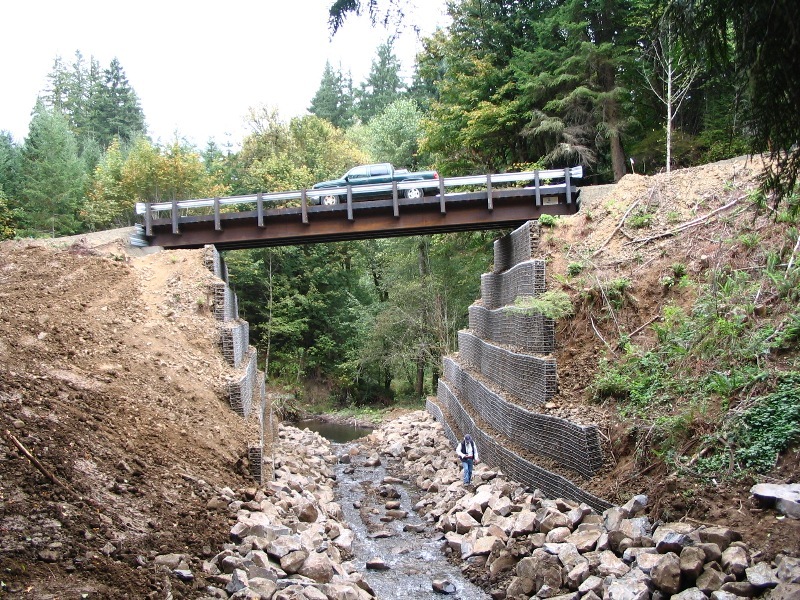 Miller Creek was the #1 fish passage replacement project in the State of Oregon prior to replacement in 2005. The Spiralnail system is a “top-down” construction system, excavation and wall construction begins at the top, the bridge was installed and the road was opened after the fill had been removed approximately 20 feet down. Operations continued under the bridge, final efforts were to remove culvert and install rip-rap. Structure: Replacement of an 84” concrete pipe with a 60-foot Big-R bridge on 36-foot high Hilfiker MSE (welded-wire-wall) Abutment Wall system; this very large MSE wall system was designed in cooperation with Aziz Engineering, Redmond, Washington. The base of the wall extends 6-feet below stream elevation. At the time, this was the tallest known application in the world using the Hilfiker Welded-Wire Wall system as a bridge abutment. 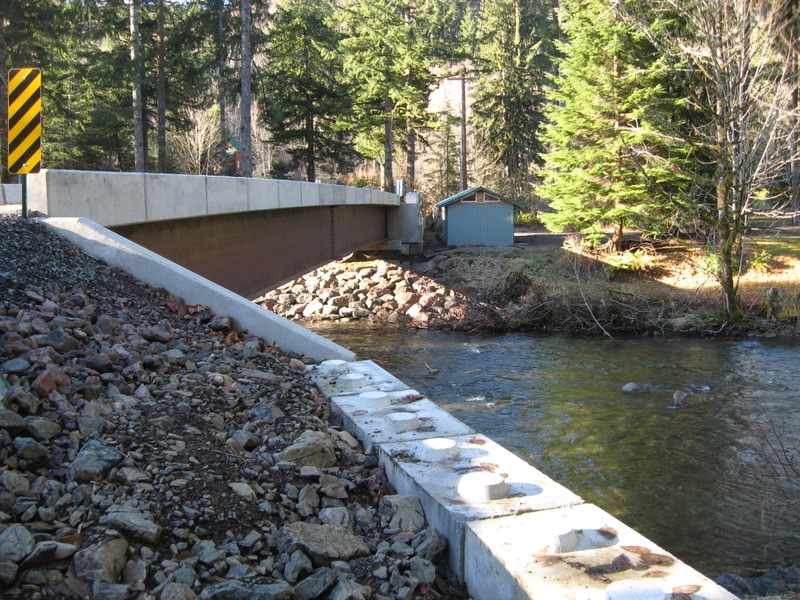 Page Creek was the #2 fish passage replacement project in the State of Oregon prior to replacement in 2005. 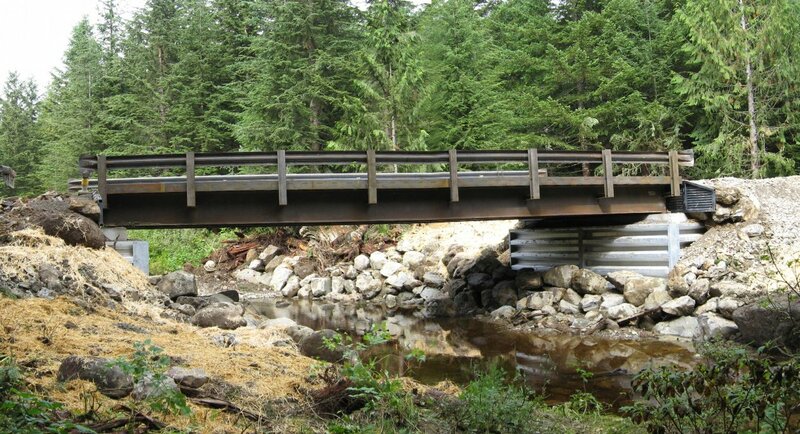 Structure: Replacement of a 106-year old railroad truss bridge with a 250-foot triple span (50’-150’-50’) Roscoe Steel bridge structure utilizing existing abutments and piers. The superstructure was designed to have a 2% residual camber. This project is situated approximately 300 feet upstream of the City of Tacoma domestic water intake, construction was completed with no sediment or pollutants entering the water supply system. Structure: Installation of a 55-foot skewed Roscoe Steel bridge on 10.6-foot high steel bin abutments replacing a 36” culvert. 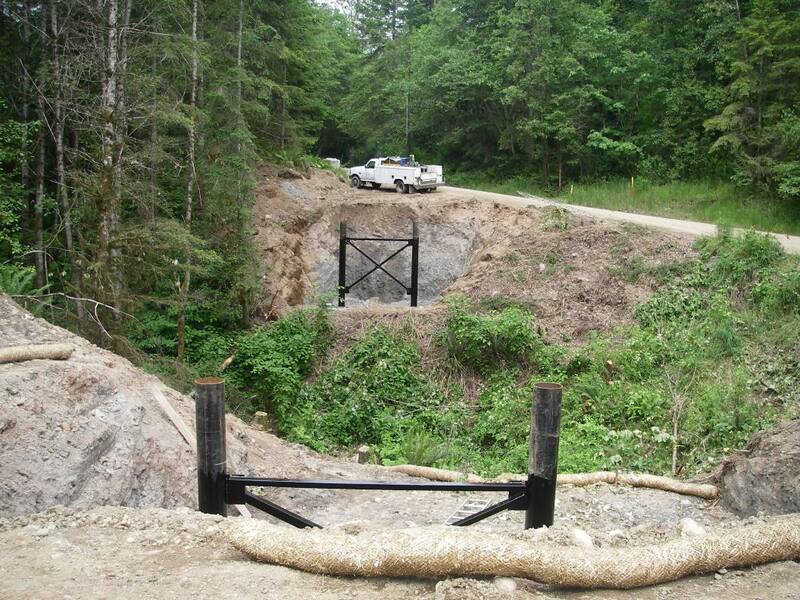 Structure: Installation of a 55-foot skewed Roscoe Steel bridge replacing a log box culvert. 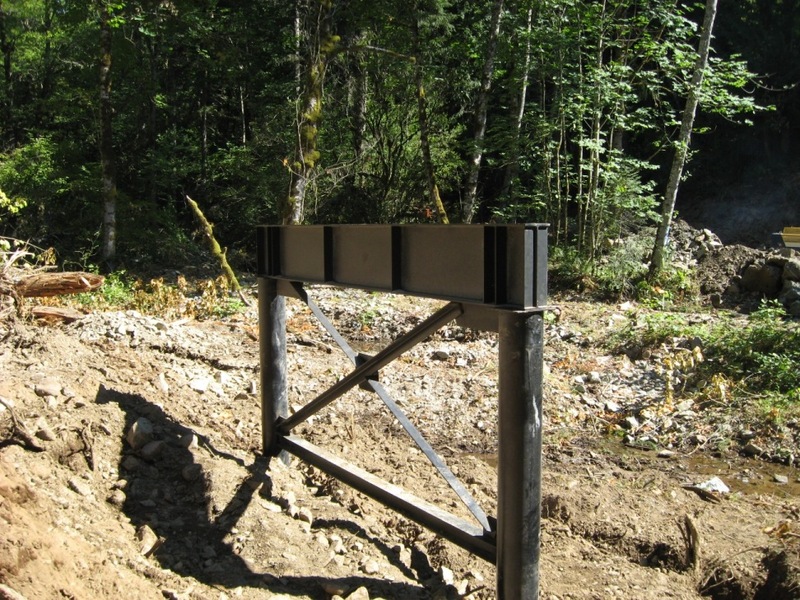 The abutment system utilizes typical concrete sills on one end and a modified sill with a “variable-step” steel riser and deadman tieback system on one side. 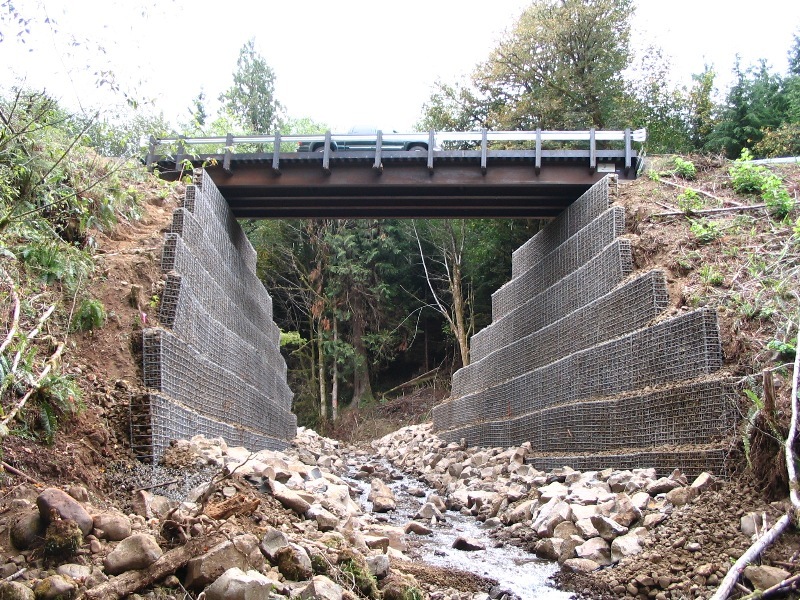 An MSE wall to support the 12-foot high road fill was constructed utilizing geogrid with an ecology-block wall facing. Structure: Installation of a 60-foot Roscoe Steel bridge replacing a 60” culvert. 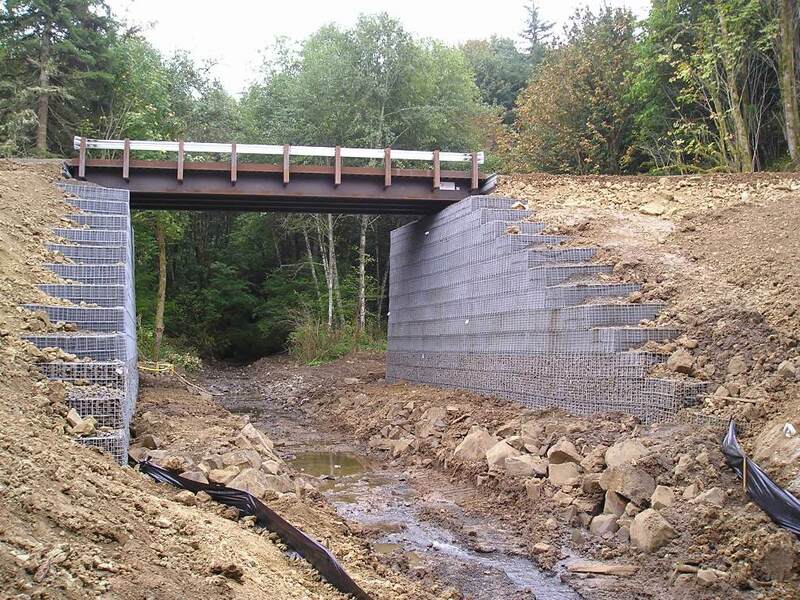 The abutment system utilizes a Hilfiker MSE wall system on one side and a typical concrete sill placed on a rip-rap fill on the other. The MSE wall allowed for a near vertical slope above the stream channel; the base of wall is founded 3 feet below streambed elevation. © Copyright 2010 Pacific Forest Resources, Inc. All rights reserved.